My son got to play the game!!! The coach called a doctor to come to the school and examine Adam (10 minutes before game time) to get a second opinion! He could find no hernia at all and released him to play. It was Adam's best game ever. 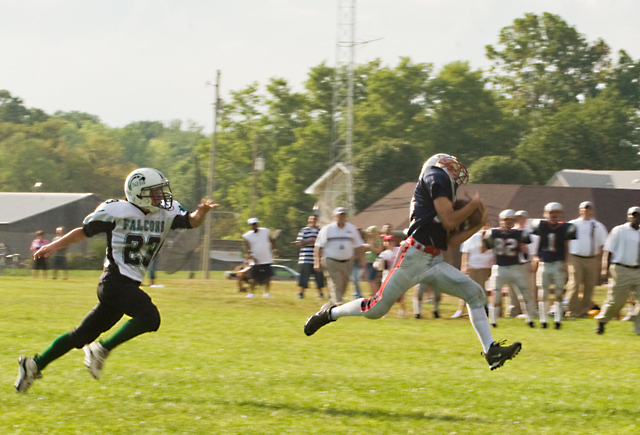 Here he is catching a long pass and scored the touchdown .. he also got 2 interceptions! He was on fire. WE WON our first game in 2 years!!! Just about a perfect stop-action shot. I wonder if there is any way you could use layers and darken the background a bit to make him really stand out. Wow! It was a big day for you. Congrats to you and your son. This is a shot you will both treasure. Thanks for sharing the joy, and I hope that the hernia will heal by itself. Congrats. Glad you got some good news! A shot to keep for posterity. Congrats!!! This is a wonderful picture - most importantly a wonderful memory, and isn't that what pictures are for? Great action captured very nicely. congrats to both of you on the victory. You for being there for 2 years, him for the td. Wow! It looks like he's flying! Tell Adam congrats on the win. Great shot! It counts for a blur and counts even more for the excitement and the years of love and support. Look at him go! Proudly hosted by Sargasso Networks. Current Server Time: 04/21/2019 04:25:36 AM EDT.